While our ongoing attorney fees are nominal, the potential exists that we may have to sue the state, so it's important to keep reserve funds on hand ready for the potential of a big lawsuit. It's important to have a legal defense fund. If you have any questions about your contributions, please call President Andy Wilson at 425-235-4558. 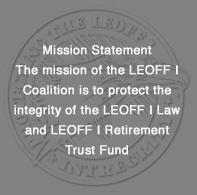 The mission of the LEOFF I Coalition is to protect the integrity of the LEOFF I Law and LEOFF I Retirement Trust Fund. LEOFF I Coalition members are law enforcement officers and firefighters.